Emergency blanket for you or your horse! Retain the heat! Year round protection for you and your horse! 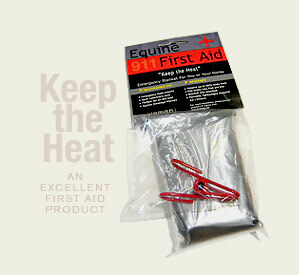 The Emergency Blanket is an excellent first aid product that should be in every first aid box! Portable, lightweight, mylar material. The small 4"x2 1/2" pouch can be stored anywhere. It opens to an 82" long blanket. A blanket clip is included. The shiny silver material reflects heat back to the body. It is ideal for emergency field trauma, massage therapy and acupuncture, foaling or calving, an anytime that convential blankets are not available or are too cumbersome. Get this and be prepared!